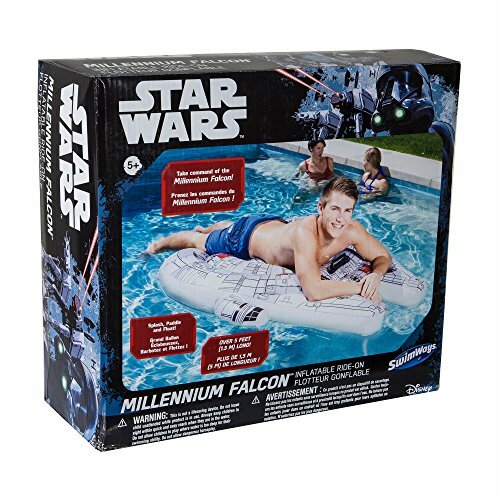 Star Wars Millennium Falcon Pool Float - Moar Stuff - You don't need it but you know you want it. The Star Wars Millennium Falcon Ride-On is a pool float from SwimWays shaped like the famous space freighter from the Star Wars movies! 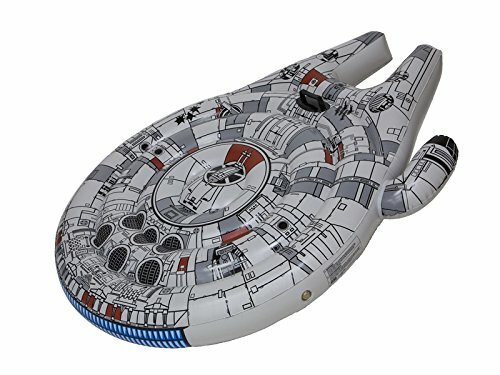 With this Millennium Falcon Pool Float you can blast through the pool at breakneck speed as you pretend to be making the Kessel Run in under 12 parsecs! 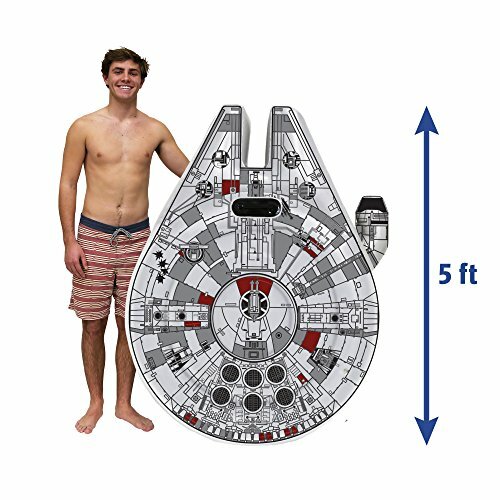 This inflatable pool float measures approximately 61 x 46 x 6.5 inches (when inflated, of course) so it’s big enough for a non-wookie to ride on comfortably. Wookies (or Vader) might need two of them taped together. While it doesn’t have any smuggling compartments (or does it?) it does have a convenient carrying handle so you can easily maneuver it to the water. Also, unlike the real Falcon, this pool float doesn’t have a bunch of holes shot in it. It’s airtight and made from pretty strong vinyl plastic so it should hold up for a while. Just don’t let your TIE Fighter Grill shoot holes in it and you’ll be fine. It’s great for pool parties , vacations, and everyday fun! Makes a fun gift for Star Wars fans of every age and for collectors, too! For kids age 5 and older. Dimensions: 46 x 6.5 x 61 inches. Includes a carrying handle for easy transport. Now you can do the Kessel Run in under 12 parsecs while wearing your swim trunks!